For multinational car companies operating in China, the euphoria from the biggest ever automotive boom in industrial history is finally being tempered by some unexpected risks, most notably a controversial investigation by the National Development and Reform Commission (NDRC) into allegedly anti-competitive behaviour by Audi, Mercedes-Benz and other brands.The investigations have so far resulted in fines that are peanuts in comparison to the vast profits that foreign automakers have enjoyed over recent years – and continue to enjoy. In July, a joint venture between Volkswagen unit Audi and state-owned First Auto Works was ordered to pay $41m for alleged violations of China’s 2008 Anti-Monopoly Law. This compares with reported operating profits of $12.2bn for VW’s joint ventures in China (its other is with SAIC Motor) last year. Fiat unit Chrysler was also hit with a small fine this summer, while Daimler’s joint venture with BAIC Motor, which makes Mercedes-Benz saloons, is still awaiting the outcome of an NDRC investigation after one of its Shanghai sales offices was raided in July. 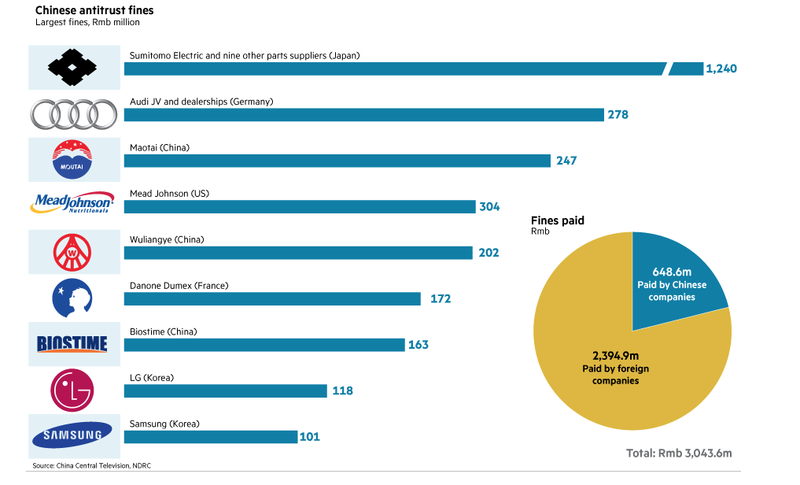 These fines are the byproduct of a wide-ranging investigation that appears to have a much larger aim – forcing car companies, regardless of whether they are in fact guilty of anti-competitive practices, to lower the prices of their vehicles, spare parts and services. According to one industry executive, the head of a multinational company’s China operations has told visiting board members that, in view of the NDRC’s offensive, his biggest fear is of a sudden shift in government policy. “It’s bad for business,” the executive says of the investigation. “It has made the investment environment very uncertain. Foreign automobile executives argue that the relatively high prices asked for cars – especially premium vehicles that can be almost twice as expensive in China as they are in the US – is a function of unprecedented demand, even for overseas models subject to expensive import taxes. China’s car craze began in earnest in 2008-09, during the depths of the global financial crisis, when it overtook the US as the world’s largest car market. Demand from entire generations of first-time drivers soared in the world’s second-largest economy, just as purchasing power collapsed in the US and Europe – a nadir symbolically marked by Washington’s bailout of General Motors in December 2008. Over the ensuing half decade, foreign carmakers in China, especially long established ones such as Volkswagen and GM, had a license to print money. Even last year, when double-digit annual growth was finally expected to taper, annual sales grew by about 15 per cent to 18m passenger cars – 10 times as many as were sold in India. This year began in similar fashion, especially for foreign brands and their Chinese joint venture companies. Sales of Chinese brands, however, began to fall sharply and their share of the passenger car market tumbled from 27 per cent to 23 per cent. The precipitous fall-off in sales of local brands and slower economic growth has forced the China Association of Automobile Manufacturers to lower its projection of an 8.3 per cent increase in year-on-year sales this year to 4.6 per cent – two-thirds down on last year. In the first quarter, Geely, the private sector carmaker most famous for its purchase of Volvo Cars from Ford, saw sales of its own-brand vehicles fall by as much as 40 per cent over the same period a year earlier. One reason for the fall has been a counterintuitive NDRC requirement that foreign-invested joint ventures develop a local brand for the China market, such as the Baojun saloon manufactured by GM, SAIC and Wuling. Many of these new entrants are priced to compete against domestic rivals, especially in smaller cities where car ownership rates are relatively low. “I don’t understand what the Chinese government’s objective was in encouraging foreign companies to create local brands,” says Bill Russo, a Shanghai-based industry consultant. “It only cannibalises already distressed sales of local brands. I think the intent was for more technology to be shared by the foreign companies. But the unintended consequence is to take volume from local carmakers producing similar products,” he adds. At the other end of the spectrum, foreign carmakers continue to thrive in saturated markets such as Beijing and Shanghai, where premium brands such as Audi, BMW and Mercedes-Benz account for a quarter of the market. Even now, limits on expensive new licence plates to combat congestion and pollution are spurring their sales, as existing plate holders trade up.